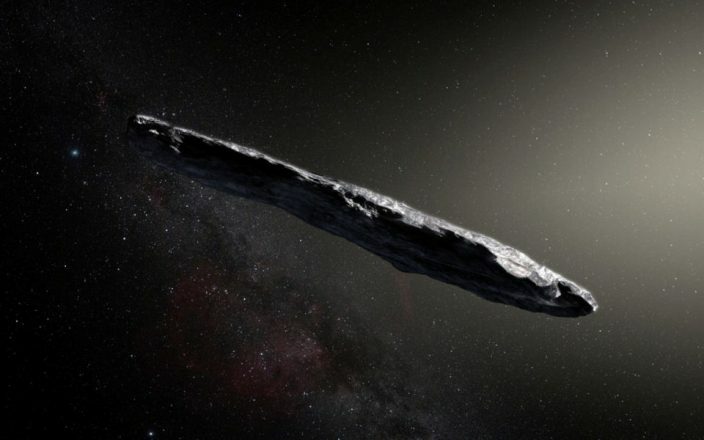 “Oumuamua”: an alien intergalactic ship or a fragment of a cosmic rock? This will be either the greatest discovery that humanity has ever made – or just another fragment of a galactic rock traveling in space. Astronomers should scan this asteroid for signs of extraterrestrial technology after fears have been expressed that it might actually be an alien intergalactic ship. Now a team of alien hunters, headed by Russian billionaire Yuri Milner, is scanning an asteroid before it goes beyond the reach of Earth’s radio telescopes. Scientists are looking for radio signals in four radio bands from 1 MHz to 12 MHz from a mysterious visitor who rushes through space with almost near-light speed, which can really mean that this is an alien spacecraft. Earlier, researchers from the CETI project indicated that the interstellar ship should have a cigar-like shape or needle shape to reduce the effects of cosmic dust. While scientists are inclined to believe about the natural origin of “Oumuamua”, although it is entirely possible that it is an artifact.